My name is Bryan Blunt. I am a FS for McDonogh 35 High School. I run a 4.6 40-yard dash. I bench 265 and squat 325. It could have went better. We had high expectations this year. Still, our team always worked hard in the weight room and on the practice field. LAFM: What has been your best game this season? Against Lutcher I had a really good game. I think I finished with 5 sacks and 3 forced fumbles. I played FS but also had to fill in at LB in some parts of the game due to some of our players being out. Eric Berry- I think he plays like me. He is a FS with the abillity to come down to the line and make a play. I was about 12 when I started to play park ball. My Mom. She was always making sure that I was never just sitting around doing nothing. She made sure I was always active. I want to major in Sports Medicine, because that can keep me around the game. . If I can not play, I still want to always be around football. LAFM: What are the top 3-5 schools that are recruiting you? 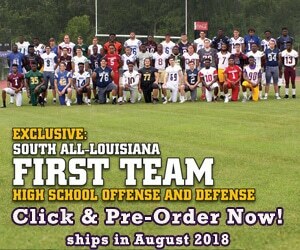 My top 3 are LA Tech, McNeese and Utah. I have no favorites although I may slightly be leaning toward LA Tech. I am being recruited as a SS. It is the hardest position on the field. We end up having to use the same skills as a WR, but are constantly having to react instead of making the initial move. Our senior class had a lot of chemistry. Most of us had started since our freshman-sophomore year. We are all good friends and teammates. LAFM: Outside of football, what makes your school or city special?